This attractive and dignified engraved and sandblasted wall sign is made of HDU. Note some of the text is engraved (incised) with our CNC router, while other text, art and border is raised with the background sandblasted. 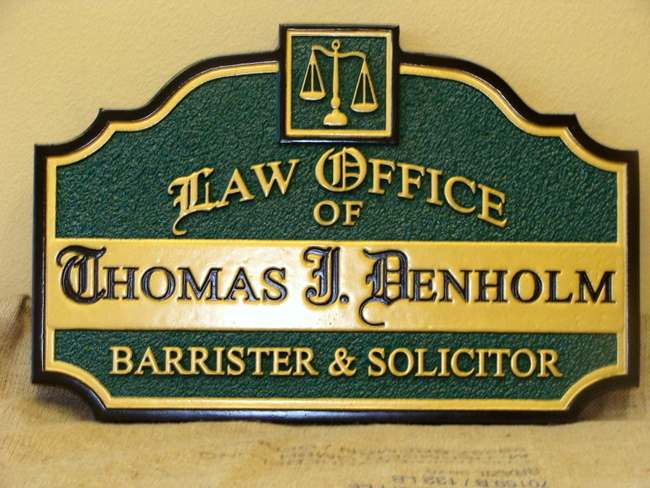 To see 250 other sandblasted, engraved, carved 2.5D, or premium carved 3D High-Density-Urethane (HDU) and wood signs and plaques for attorneys, law offices, prosecutors, judge chambers and courtrooms, please click on Gallery 10 - Attorney , Law Office, and Courthouse Signs and Plaques. We can make a carved, engraved or sandblasted wood or HDU sign or plaque of any design in any size from 12 inches to 96 inches, for either indoor or outdoor use. These can be placed on iron or wood posts, a wall , a monument base, or on an outside or inside door. We can customize these signs with any shape, border, font style, or color scheme with carved (engraved) or raised text and art of your choice. For more information on design options, prices and delivery times, please call us at 951-698-8484 or email us at info@artsignworks.com, and our knowledgeable and friendly customer service representatives will be pleased to help you. Please click on Home to see our home page. You can click on one of the numbered gray boxes on the lower left margin of this page to see other Photo Galleries, or use the navigation dark gray tabs at the top, or the gray boxes in the upper left margin to see other information. You can search for a specific sign type on this website by typing in key words in the Google Search bar at the top of this page Return to the Gallery 10 (Attorney and Courtroom signs) page by clicking on "Return to List" below right.